It was late Winter during our visit. 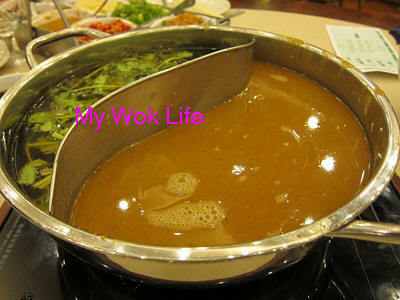 Still considered good time to have hotpot, especially after taking a breezy walk in the cold evening. 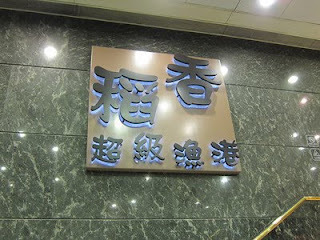 I already had a list of hotpot location in mind, and my final choices streamed down to between Yau Gwat Hei Hotpot (有骨氣火煱專門店), serving value priced buffet, and Tao Heung Pier 88 aka Tao Heung Super 88 (稻香超級漁港), the branch restaurant of Tau Heung Holdings (稻香集团) which looked more elegant than the other. Gathered much feedback, decided to go with the later, mainly due to its convenient centralized location. Crowded on a Friday night, a pool of people were seen waiting hungrily at the entrance. Not quite yet figuring out our waiting time, we were directed to a table barely upon our arrival. (Hmmmm? Tell you why later.). 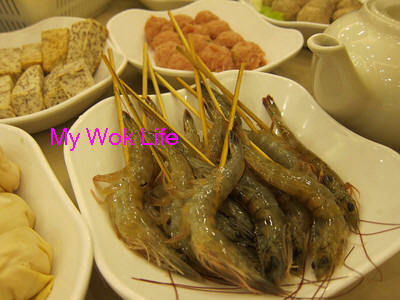 Food items, including the options of soup base and the dipping sauces & garnishing, were extensively great. Plenty to choose from.. There were options for both the superier (HK$68/ S$12) and standard soup base (HK$48/ S$8.50), price varied, depending on your choice. They served also set menus for the hotpot ingredients where soup base of your choice would be complimentary. If you need to refill the soup, do not be shocked if they pour in hot plain water. Yes, they do not replenish the actual soup, but with the hot water. Don’t be displeased, this probably was how most of the hotpot restaurants work. As for hotpot ingredients, we did not order any of the veggie, meat or seafood set on the menu (which some said it’s more worthwhile to order the sets) as some of the items in the set were not what we liked. Instead, I ordered a plate of live fish slices dish (A plate of deli thin slices of good fish which obviously cost more (HK$128/ S$23) than the usual fish slices (HK$30/ S$5.50). I would not miss having the sashimi Geoduck (A type of giant clams where its flesh sticks out from the shell resembling a tiny elephant trunk). Eating sashimi geoduck reminds me of my fond memory of having it the first time when my parents first brought me to Hong Kong, and I fell in love with it. The sashimi geoduck was so fresh that it could be eaten raw, or simply blanch in the soup for few seconds if you would like to have it warm. The sashimi geo duck priced at HK$148/ S$26 per serving. 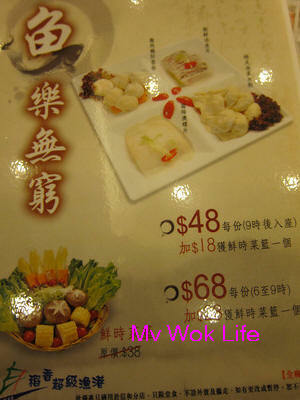 Deli-thin Angus beef slices (安格斯肥牛) – *We did not take beef, but saw many diners ordered. As for other ala-carte dishes, I ordered prawns, clams, Osmanthus mussels, dumplings, wantons noodles, vegetables, yam, and MANY balls dishes! For two of us, we had a large plate each of fish balls, prawn balls, handmade minced pork meat balls, large pork meat balls, squid balls, chicken balls, and etc (I was ‘blinded’ by all the alluring food pictures on the menu when placing order, just wanted to try a little of each, in fact.). 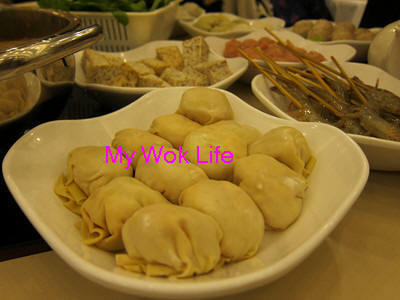 They were all served in large serving of 12 pcs each item. Yes, it was value for money with the generous portion served (generally HK$28 – $40/ S$5.50 – $8 per dish), if you have more people to share with. Tempted to order ALL on the menu, I would highly recommend Osmanthus mussles (桂花蚌). Osmanthus mussles is NOT a mussel, and has NO relationship with any type of clams, Osmanthus mussel is actually the internal organ of sea cucumbers (海参). It does not smell or taste awful at all. 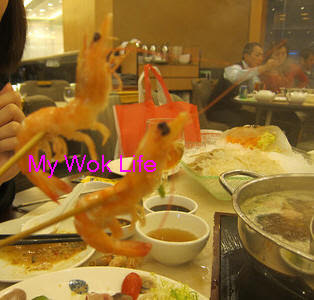 Instead, it tasted so crunchy with natural sweetness yielded from it, after a quick blanch in the boiling soup. The Osmanthus mussles looked beautiful, and claimed with great nutritional value. 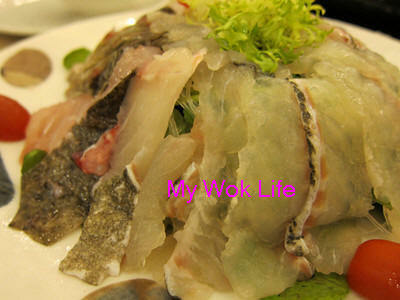 Osmanthus mussels (桂花蚌) – *Sorry, forgot the pic shot. Eating hotpot in Hong Kong was fun with the assortment of dipping sauces and garnishing. There were 8 types in the tray to choose from, and these condiments were charged with an additional HK$8/ S$1.50 per pax. It’s alright to charge for condiments, but the staff actually rushed to take away the tray before we were done taking. We had to constantly request extra condiments to be served. Not sure why, but this usually not the case as I saw many tables had their own tray permanently stationed on their table. Frankly, I wasn’t sure if it was utterly my fault for being greedy, or should the service crew who took our order be blamed, for the excessive order placement we had! 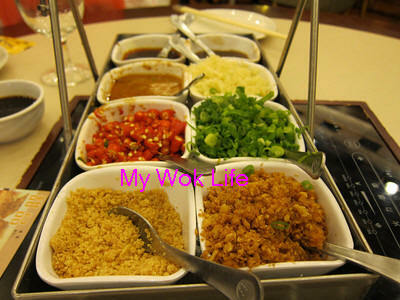 When come to ordering of food, friends would always leave the job to me, and most of the time, I did a pretty good job, ordering just the right amount. For this, however, I ordered nonsensically! Goodness, the portion of each item served so largely, enough to feed 6 – 8 diners! 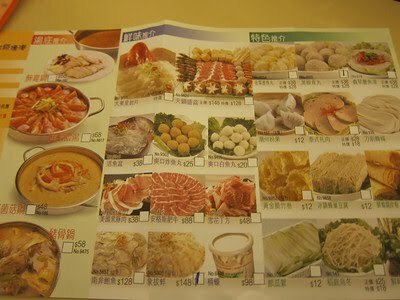 Look at our tableful of large hotpot ingredient dishes for just two. I seriously thought it was their job to advise customers if the ordering goes out of proportion! Please, at least show abit of initiative! Well, to save my own bucks, I could have been more mindful to notice. I would be smarter than this next time. Well, it was OK for not able to finish up all the food (with just a little of each dish, we ended up leaving half the orders untouched) as long as we were happy with the meal. :) Yes, I was happy, no matter how. Always happy to go on a vacation with the right companion. * Do not over order as each serving comes with large portion. * Order the combination set for small group. Repeat order a little by a little (from their ala carte menu) only later, if necessary. They serve pretty fast. 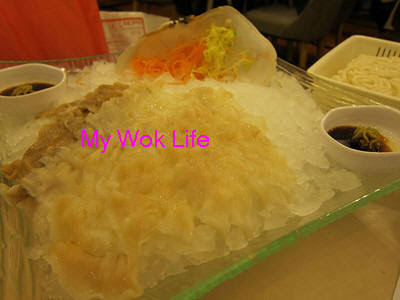 *See fish items set on pic. * Dine in after 9pm for good offers, especially if you are on vacation and do not mind eating late. * Take away the leftovers: If you wished, ask for disposable food box to take away the leftovers. They will be happy to pack it for you for any food items you could not finish there. “Tao Heung” specializes in the hotpot business. It assimilates different culture and maintains its original characteristics at the same time. In order to fulfill different customers’ need, “Tao Heung” targets in creative and healthy hot pot food. 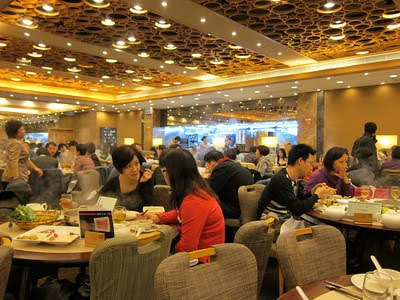 Pier 88 is renowned for its fresh, value-for-money seafood and distinguished hot pot. Our kitchen masters with ample experience in seafood cuisine are scrupulous from selection of ingredients, cooking to final product, so as to maintain our superior quality in both outputs and services.